THE EMERALD FOREST - ARTE AMAZONIA provides a global voice through art for the indigenous cultures of the Amazon. in Brazil. Boothe's son is kidnapped by indigenous people called the Invisible People, and raised as one of their own. The father spends the next ten years searching for his son in the jungle, but when he finally finds him, the blond-haired boy is a fully-assimilated Indian and a respected hunter in his village. 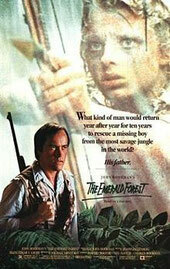 The father realizes that the boy can never go back to civilization, however, the two team up to fight a gang of Brazilians who are kidnapping their women for prostitution, and in the course of getting to know the Invisible People, the father reconsiders his dam project and decides to help his son so that the way of life he has adopted is not destroyed.The Emerald Forest is a great intro to the theme of indiginous struggles with that of western values.